Comments/Context: Sara VanDerBeek's small solo show at the Whitney is modulated and meditative, an atmospheric exercise in muted color. 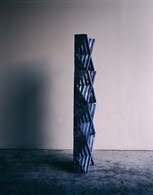 In a departure from her photographs of carefully constructed conceptual sculptures of appropriated/collaged images, these works rhythmically alternate between images of pitted concrete foundations unearthed in the Lower Ninth Ward of New Orleans, angular, geometric sculptures made in her studio, and details found in her childhood home of Baltimore. The entire project is wrapped in the mantle of Walt Whitman, borrowing its group titles from Leaves of Grass. In general, while these works have a lovely pale serenity, I think the overall experience misses the mark a bit. My enjoyment of the soft, diffused feeling of the photographs was disrupted by an underlying sense of the artist trying too hard, of a self-conscious, conceptual artiness that seemed too contrived. 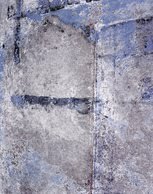 But this same knock could be leveled at any number of inward looking, mystical or symbolic photographers across the decades (Szarkowski's "mirrors"), especially those who have regularly employed abstraction. These new works do successfully create a mood, I'm just not sure it is one that we haven't felt before. 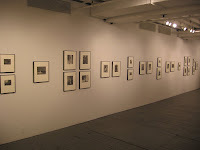 The Fall photographs season moves to London next week with a various owner sale at Phillips on Wednesday. The auction contains an unusually broad mix of material, with another installment of Japanese photography from the Jacobson/Hashimoto collection, paired with a number of lots by Araki and Moriyama. Overall, there are a total of 192 lots available here, with a Total High Estimate of £1552600. Bonhams' various owner Photographs sale next week brings together its customary West coast flavored selection of lower end material. 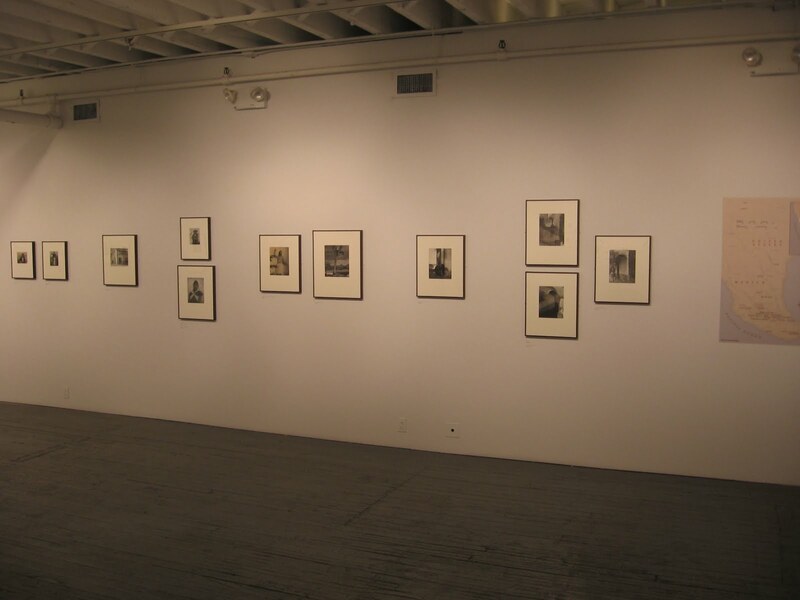 The auction contains a number of Cole Weston prints of Edward Weston negatives. 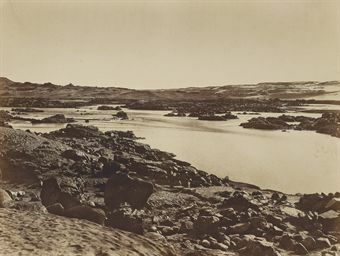 Overall, there are 110 photographs on offer, with a total High estimate of $748500. Comments/Context: As I came down the stairs into the funky, low ceilinged mezzanine space at the Whitney and got a first glimpse of the newest Friedlander show, I couldn't help but chuckle. 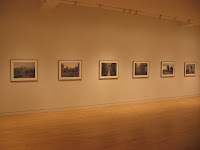 Once again, the prolific Friedlander seems to have gotten his way - it's a densely packed installation of more pictures than any other normal photographer would dare to hang in such a cramped space. What I found most interesting about this particular body of new work is that it feels a little like a victory lap. 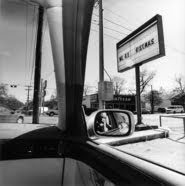 Friedlander has gone back out on the road, traveled through the truck stops and big cities of this great land once again, and made pictures of nearly all the same subjects he covered earlier in his career. There are mountain and desert landscapes, images of monuments, chaotic urban cityscapes, witty jokes made from vernacular architecture and roadside signage, self-portraits, and angular juxtapositions of abstract geometries in flat picture planes. There's even some chain link fence for those of you who want to go back to the early 1960s. 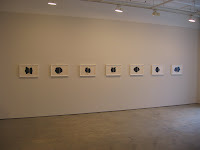 The show itself is carefully sequenced into loose groups of common subject matter that flow into one another. Stop signs become broad landscapes, which become road signs, which become portraits, which become industrial views, which become echoes of circles, which become trucks, which become roadside memorials, and so on and so on. Patterns repeat and replicate, blossoming into new ideas that morph once again. 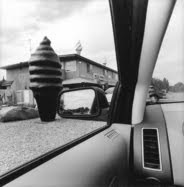 The commonality of the framing device becomes a bit monotonous across so many images, but it is altogether amazing that Friedlander can take such a simple, almost boring idea (pictures taken through the car window) and explode it into something so multi-faceted and original. His voracious eye takes the organizing principle and then extends it to its limits, creating an entirely new vocabulary out of the obvious. He does all this with impressively consistent joy; jokes, puns and ironies are to be unpacked and discovered everywhere. Overall, I think this is a highly accessible and likeable body of work, that entertains on the surface and rewards a deeper and more thoughtful examination. 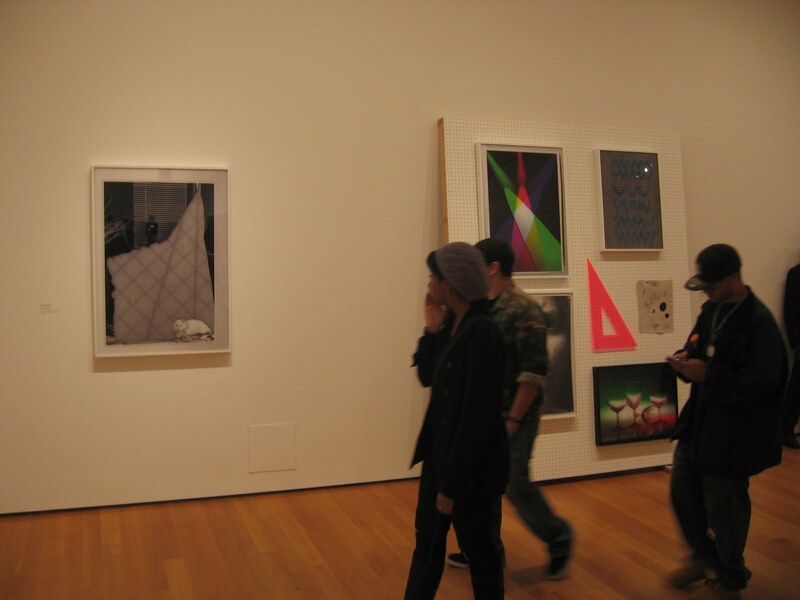 The crowded rooms were full of "did you see that one? 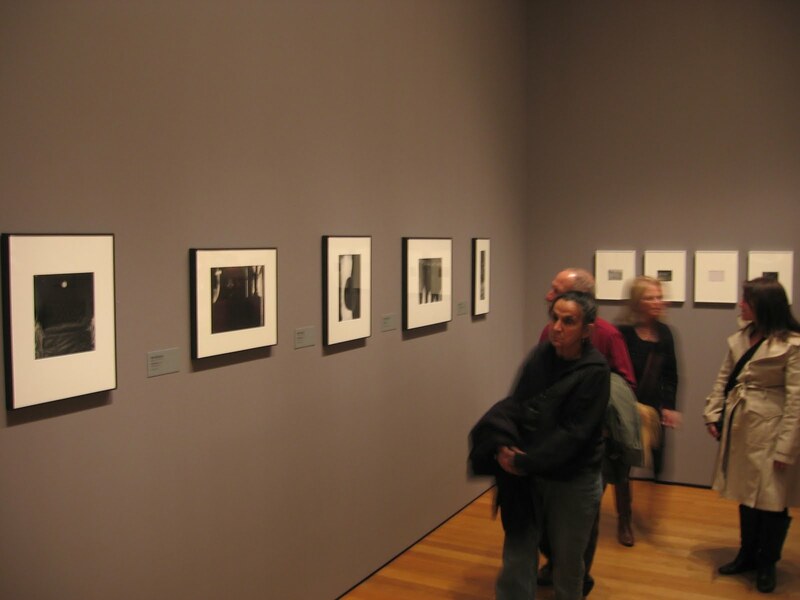 ", "look over here" and smiling pointed fingers, from school groups and adults alike, all equally fascinated to see the world through Friedlander's restless eyes. Comments/Context: This year's New Photography exhibit at the MoMA might better be called "Offspring of the Pictures Generation". The show gathers together the work of four contemporary photographers who have continued down the path of image appropriation and recontextualization, evolving their aesthetic approaches in the crucible of the recent explosion of media. They borrow from movies, magazines, fashion, and commercial/stock photography with equal ease, often infusing the seemingly random with unexpected significance. So how have these descendants changed the culture of appropriation, 25 years later? To my eye, they have stripped away the biting humor that made the images from the Pictures Generation so striking; gone is the subtle wry wit with an undercurrent of emotional outrage that lurked beneath those compositions. These new works seem more neutered, much cooler and more distant, rich in intellectualism and conceptual theory, but generally lacking in the spark that grabs and holds a viewer's attention. For Roe Ethridge, only the lusciously furry bowl of rotten fruit provides much of a jolt. His blurry pixelated plate on top of a crisp black and white scarf seems a bit forced and self-conscious. For Amanda Ross-Ho, appropriation and process have been mixed together, documenting a calculated inner landscape of studio remnants and familial connections. Her sculptural installations clearly have layers of conceptual significance, and yet they left me cold. Elad Lassry's matchy-matchy isolated magazine images against paired colored backgrounds/frames at least have a bit of playfulness to them. I particularly liked the wild pink hat (owned by collector Peter Brant); the red nailpolish on green pedestals and the Herend monkeys against green were also vibrant and memorable. Lassry smartly breaks up the monotony of the commercial photography feel by adding in a blur or multiple exposure here and there, so the walls don't feel like an endless parade of candy colored stock images. Alex Prager is in many ways an outlier in this show, since her large scale photographs aren't direct appropriations or theoretical exercises, but glossy stylistic echoes of cinematic glamour. 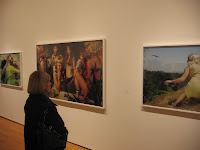 That said, they are by far the most approachable works in the exhibit, evidenced by the continued clustering of the crowd in her corner of the gallery. Her retro world is invitingly dramatic and visually stunning, and quite a bit less overtly intellectual. In the end, while I like the thematic construct of this show (and I think it is altogether worthwhile to explore how appropriation is being updated by contemporary artists), the payoff isn't particularly stunning or sensational. I wonder if simple image reuse has now become so commonplace that it wholly fails to surprise us, unless some additional element of originality or shock (visual or intellectual) is introduced. Is this photographic genre slowly being anesthetized by overuse? Most would say no (it's only the beginning), but perhaps it is time to re-evaluate this approach once again, and look for a crackling disruptive jump to someplace entirely new. None of these artists has any significant secondary market track record, so gallery retail will likely be the only option for acquiring their work in the short term. Rating: * (one star) GOOD (rating system described here). The results of Swann's various owner photographs and photobooks sale last week were generally uneventful, with an overall Buy-In rate just under 35% and Total Sale Proceeds that missed the estimate range by a pretty decent margin. Over 38% of the lots that did sell came in below the low estimate. The top lot by High estimate was lot 91, Adam Clark Vroman, A Trip to Snake Dance, Moqui-Indian Towns, and Petrified Forests of Arizona, 1895, at $30000-45000; it was also the top outcome of the sale at $48000. Comments/Context: Master photographer Paul Strand spent the period between 1932 and 1934 in Mexico, and many collectors will be familiar with The Mexican Portfolio, the tightly edited 20 image output from his extended journey there. In this museum quality exhibition, Aperture has extended the academic study of this period in Strand's career and unearthed a treasure trove of published and unpublished images from his time in Mexico. Taken together, they provide a much broader context for understanding both the evolution of his artistic approach and the larger social and political forces that were at work during those years. 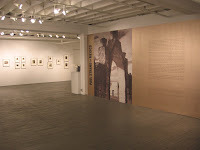 Strand's images from Mexico can be roughly grouped into four subject matter genres: portraits of people, landscapes, architectural details, and images of religious folk sculptures and icons. Many of the essays in the accompanying monograph see these images coming together to provide a portrait of the country's character, or as a visual document of a specific place and time, and I think that analysis has some validity; as a whole, when seen in sequence, Strand's photographs have clearly captured an interplay of cultural and natural forces that coalesces into a common environmental mood. 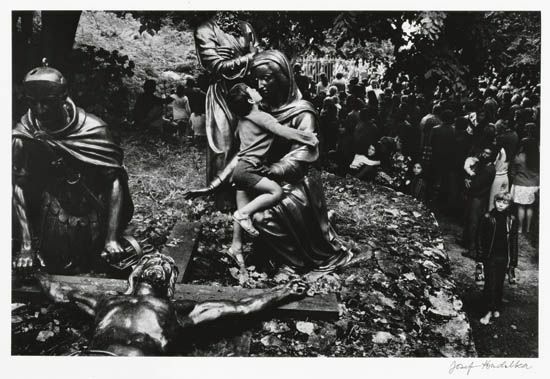 What I found most striking was the mixing of documentary and artistic sensibilities, where Strand's rigorous aesthetic control has been combined with the emotional suffering of the religious artifacts, the severity of the land and its buildings, and a subtle patina of nationalist fervor. To my eye, the portraits of the people (whether we call them local, indigenous, native, or just the rural poor) are the standout pictures in this project. Men, women and children stand against pock marked brick walls and wooden doors or sit on the ground holding baskets. They wear everyday clothes: hats, capes, ponchos, cotton wraps, covered in dust and full of holes, bare feet sticking out. The images mix textures rich in tonality, and find contrasts of dark and light, with shadows slashing across backgrounds. But is the harsh power in the faces that makes them memorable; there is heroism, grace, patience, and dignity in these portraits, with an undercurrent of steely strength. The consistent dynamic quality and intensity of these photographs is truly astounding. I am very pleased to see Aperture really pushing the scholarship ball forward here. The monograph is really a catalogue raisonné of Strand's Mexican work, documenting every single image in the Archive and providing further historical context for his relationships, influences, and activities. It is an invaluable reference tool for this specific Mexican work, and provides a surprisingly extensible framework for thinking about Strand's work in other locations around the world. So come for the show and see the unknown back story to The Mexican Portfolio, and then take home the wrist breaking book for further study. 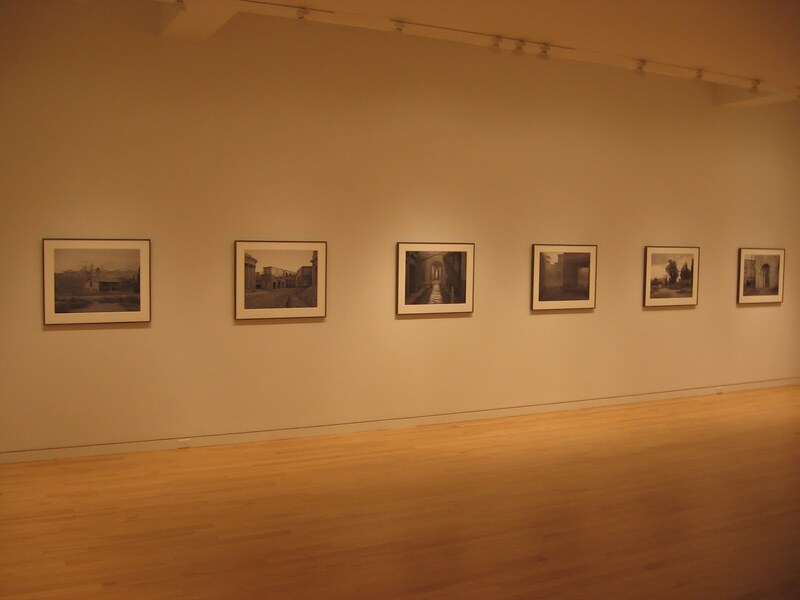 Collector's POV: Aperture represents the Paul Strand Archive, but this show is more like a museum exhibition than a gallery show; none of the works is readily for sale and no price list is available. 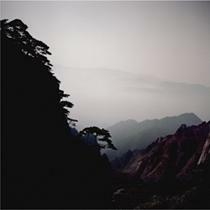 Limited edition posthumous prints of some of the images are available directly from Aperture for $450 each (here). 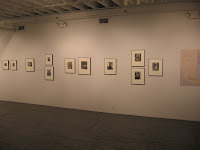 Strand's The Mexican Portfolio of photogravures was originally issued in two different edition sizes: the first in an edition of 250, and the second in an edition of 1000. These portfolios can be found in the secondary markets relatively regularly, with prices for the first edition ranging from $10000 to $45000, and prices for the second edition ranging from $2000 to $10000. Individual prints from his time in Mexico are more scarce, with prices ranging from $3000 to $65000 in recent auction sales. Comments/Context: If you were to look in one of my little notebooks where I write down notes from photography shows I visit, you'd see that for every show, I try to put down a list of stream of consciousness adjectives that pop into my head while seeing the work on view. Later, when I write the reviews, I use these words to help me get back into the same frame of mind I experienced while standing in the gallery. For this show, which is only a small part of a much more sprawling exhibit of painting and sculpture, my notebook contains the word INFURIATING written in all capital letters. I can't say that I can remember ever using the word infuriating to describe a show of photography, and yet, my annoyance with the exhibit was indeed quite piercing. 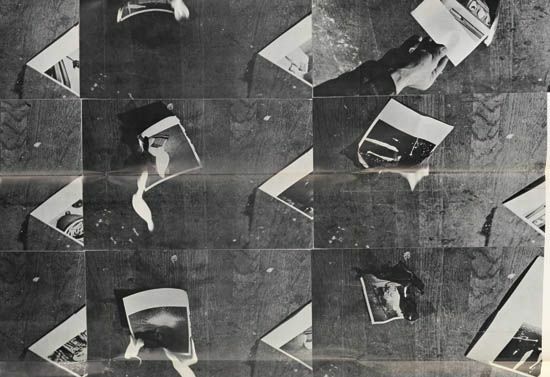 The reason is that I think the selection and sequencing of works is a massive missed opportunity to tell a more compelling and coherent story about the role and influences of Abstract Expressionism in photography. 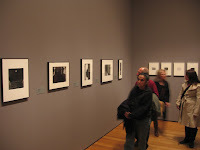 While I realize that MoMA does not hold every great work of AbEx photography, I had such high hopes that we would, for once and for all, get a lucid explanation of how photography and the other arts interacted with each other, how the visual vocabulary evolved over those decades, how aesthetic ideas bounced around and were incorporated back and forth between artists in different mediums. Unfortunately, this mini-show could best be called "Some Abstract Expressionist Photography from the Collection"; it entirely lacks a definite point of view, it has no apparent thesis which it is attempting to prove. 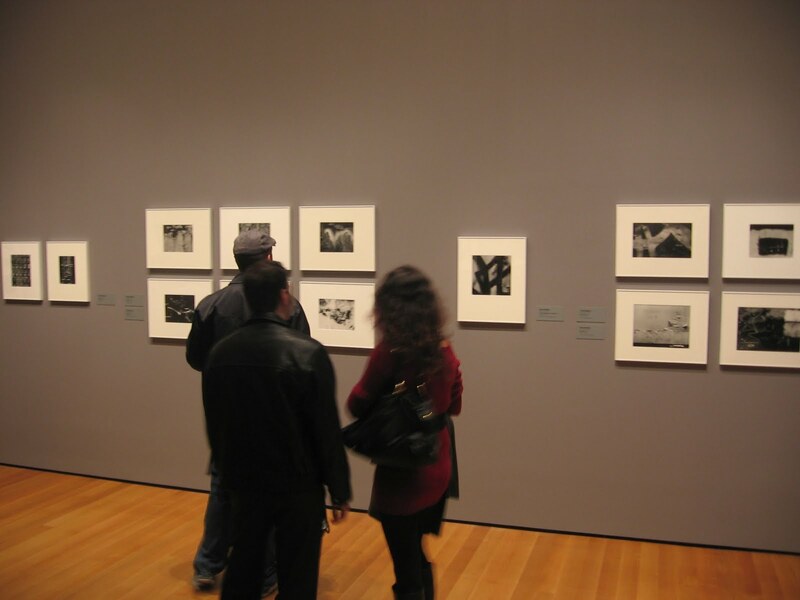 This is not to say that the photography on view is somehow deficient. 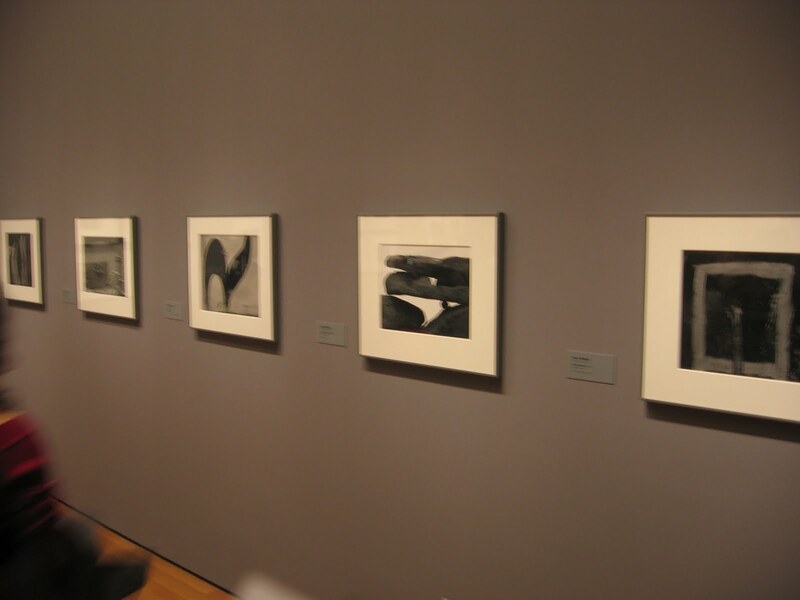 On the contrary, there are great works, particularly by Siskind and Callahan, that tackle many of the same themes of abstraction raised out in the painting galleries: scale, gesture, fluidity, and compositional complexity. As one might expect, Siskind's peeling paint, up-close walls, and dripped surfaces make an appearance, as do Callahan's swirling light on water, spiky grasses, and multiple exposure city views. 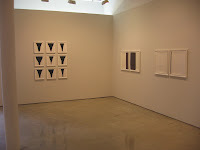 Rather than simply dismantling this show as a disappointing failure, let me offer two ways that I think it might have been more successful in teasing out the connections to the work in the other galleries. First, the works in this room are not organized chronologically, they are instead mixed around, likely based on the quirks of balance in hanging the room. 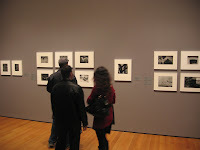 What I would have preferred is a very rigorous chronological look at how photography was evolving over these decades. We needed to see the specific difference between the aesthetic ideas of early 40s Siskind and Callahan, versus what came in the late 40s, or 50s, or even 60s. These periods don't all meld into one, they are distinct, and there are important evolutions of style and subject matter that get muddied by jumbling the pictures around. Similarly, the work of other AbEx photographers needed to be put into this chronological framework to better see how they fit into the larger trends. Then this whole package could be better matched against the themes explored in painting and sculpture - and then we would be able to see how photography reconsidered the gestural ideas of painting, how the picture plane got flattened, who influenced who, who took something and changed it, and who was simply derivative. Until we line up the works by date, and match all the photographs from 1942-1945 with the works in painting and sculpture from those same years (for example), we won't be able to draw any conclusions about what was really going on. This is what was so intensely irritating for me about the approach that was employed; it is impossible to discern any thoughtful connections. 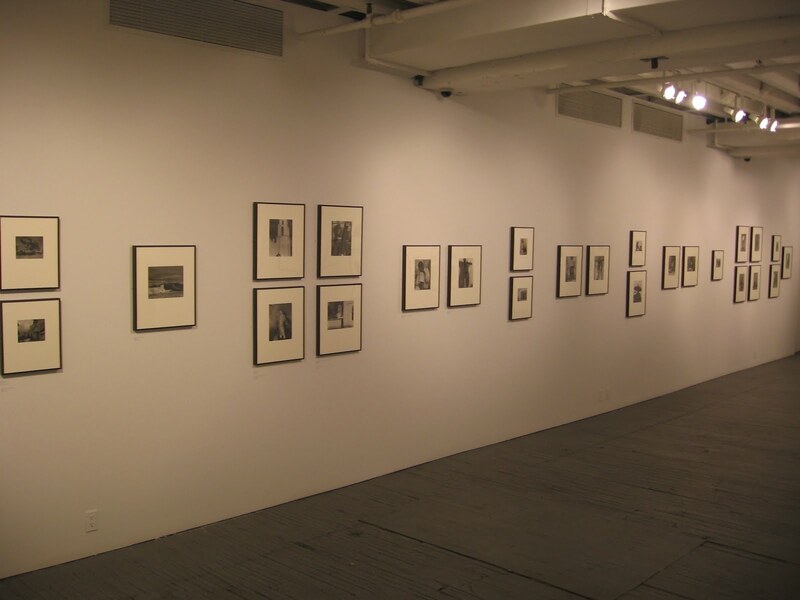 Another way to perhaps clarify the ideas would be to pare the photo portion of the exhibit down to just Siskind, or just Siskind and Callahan (although we might make an argument that he really isn't "New York"), instead of a survey of the many photographers working during the period. Then again, a strict chronological hanging might help tease out the nuances of aesthetic influence, albeit on a smaller, single artist scale. I found the inclusion of an image from Siskind's Homage to Franz Kline series to be particularly maddening. 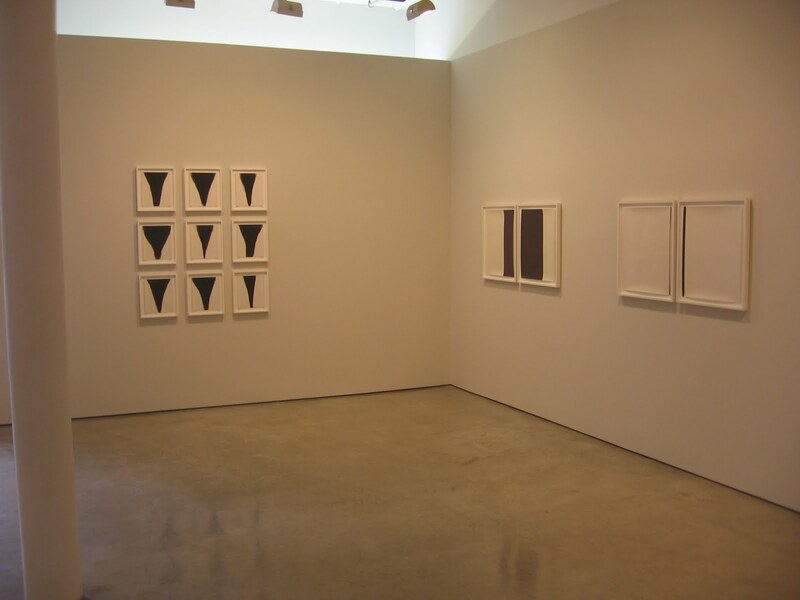 Of course, I understand why it is here; it has bold strokes of black lines that echo Kline and show that Siskind was interested in many of the same ideas. But it was done in the 1970s. It is an afterthought, a look back, not a point of actual influence in the discussion. There are no paintings from the 1970s or 1980s in the larger exhibit that are "in the style of" the earlier AbEx painters. That's not what this exhibit is about. 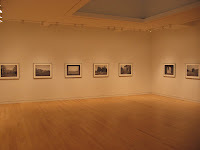 I was really hoping that this exhibit would integrate photography into the larger thesis, treating it as an equal in the exploration of how this important period in American art history actually took place. Instead, photography is off in the corner, once again a novel tangent, and the organization of the works actually on display does nothing to make the case that anything important or influential went on behind the camera. What chafes me most is that I think that there may indeed be some startling connections that would be amazing to see, if someone would take the time to rigorously look for them. That unfortunately did not happen here. And so I scratched down my all capitals INFURIATING and left the room wondering about what might have been. 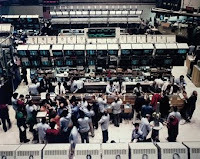 Collector's POV: Since this is a group show of vintage work in a museum setting, I'm going to forgo the usual discussion of prices and auction histories. But while my comments above might lead you to believe I somehow didn't like the work on view, the truth is in fact the exact opposite. 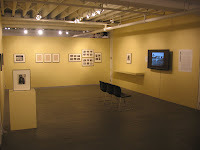 In fact, we actually own prints (or variants) of several of the works on display in the show and will likely add more images to our collection from this photographic period in the future. Christie's had a strong response to the photography buried in its two Frieze week Contemporary Art sales in London last week. The seven top lots by High estimate all found buyers, and the Total Sale Proceeds came in solidly above the high end of the range. The first photograph of 2010 to cross the $2 million dollar mark was hammered down at Sotheby's in London last week, when Andreas Gursky's Pyongyang IV brought home £1329250 (using an exchnage rate of 1.56, it tallies to $2073630 to be exact). It was the largest photo outcome at auction in more than a year. The voluminous proceeds from this lot helped to supercharge the results for the photography in the entire two-part auction, bringing the Total Sale Proceeds in above the pre-sale estimate range. The photography on offer in Phillips' Frieze week Contemporary Art sales in London last week delivered rather uninspiring results. The Buy-In rate for photography (across both the Evening and Day auctions) was over 30% and the Total Sale Proceeds from the photo lots missed the low end of estimate range. It certainly doesn't help when 3 out of the top 4 lots fail to sell, but the lack of positive surprises in the two sales says that the bidding action was relatively muted. 88.00% of the lots that sold had proceeds above or in the estimate range, and there were no surprises in these sales (defined as having proceeds of at least double the high estimate). Comments/Context: Alec Soth's first major museum retrospective is now on display at the Walker Art Center in Minneapolis, and for those of us who won't likely get to see the show in person, this excellent catalog provides an unusually comprehensive view of his career to date. 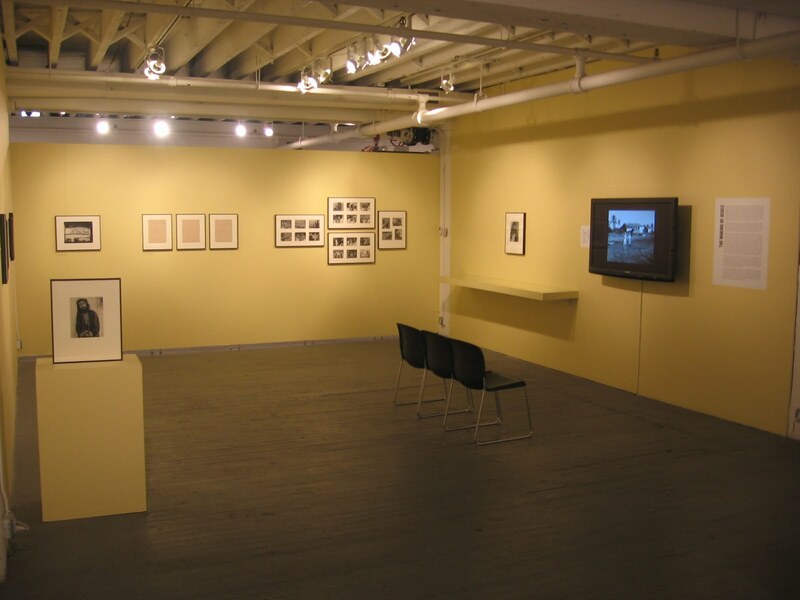 An artist's first museum survey is usually an occasion for a carefully selected sampler of work from different projects, tied together with a handful of somber, scholarly essays, published in grand style to befit the seriousness of the moment. What I like best about Soth's catalog is it's overt subversiveness; while it of course contains plenty of images from the past 15 years and a handful of texts, it's overall feel is unlike any other exhibition catalog I have ever encountered. The cover is both unpretentious and quirky. The essays wander all over the place, following exploratory tangents. 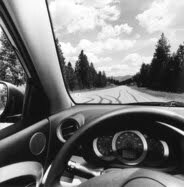 Choice blog posts are interleaved, like little vignettes or thought bubbles. The obligatory artist interview is actually insightful and revealing. In short, the book is personal, real, and intelligently authentic, rather than packaged up in the normal trappings of haughty art world cool; it is joyfully nerdy and unabashedly eccentric. 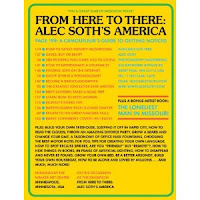 The catalog covers the entire arc of his career to date, starting with his early black and white images from the 1990s, through Sleeping by the Mississippi, Niagara and The Last Days of W., to newer projects like Single Goth Seeks Same, Broken Manual, and The Loneliest Man in Missouri. Seeing all the work brought together and sequenced in rough chronological order, my biggest take away is that the pictures are a thorough and penetrating reflection of Soth's day-to-day life as an artist. The cacophony of ideas that swirls around and between the photographs repeatedly comes back to Soth's process: his wanderings, his road trips, his searching for lists of random things, his patience, his vulnerabilities, his discoveries, his chance encounters. He is the main character in this transparent novelistic story; the startling pictures are the inextricable end product of his purposeful excursions out into the world around him. I think Soth's success as an artist stems directly from his ability to cautiously open himself up to the frailties and anxieties of others, and to see in them some of the same seeking that lies within his own personality. Even in his earliest pictures, he catches the subtle awkwardness of strangers at a bar, a man and his poodle, a personal ad printed on a billboard in front of a snow covered yard - people looking for ways to connect, to share their passions, to be loved. Fast forward a decade, and he is still searching, seeing goth girls not as weirdos on the margin, but simply as people expressing their individuality and looking for like-minded souls who will treat them with respect and dignity. Another way to get at this idea is to say that Soth's pictures are always documenting emotions (even when they are obviously still lifes, landscapes, or architectural images). He has rejected all of the prevailing memes of recent contemporary photography: the cool conceptualism of the typology, the anything is art aesthetic, and the self-reflective art about art. He has instead turned inward, become introspective, and perhaps inadvertently tapped into the mood of current-day America. The more he does this, the better (and more nuanced) his pictures seem to get. The images from Broken Manual chronicle the lives of people trying to escape society, to live off the grid, in buses, caves and underbrush, with unruly beards and hand made tools, a hauntingly appropriate metaphor for those struggling with today's economic hardships and feeling like they have nowhere to turn except to run away. Each one is just a piece of a very personal narrative, suggesting a more intricate story than meets the eye. Each also depicts a hidden landscape of emotional terrain, of reasons and rationales, of individualism, defensiveness, loneliness, fear, anger, and exhaustion. The little artist's book tucked in the back of the catalog (The Loneliest Man in Missouri) is equally poignant: snapshots of men alone in cars, solitary men trudging through parking lots and along sidewalks, splashing lake fountains, and finally Ed getting a birthday song in his living room from Blaze (a stripper from Miss Kitty's). The mini-theme unfolds with restraint, meandering here and there, and eventually punches you right in the gut. In both projects, Soth the artist and Soth the person are inextricably intertwined; he is both the narrator who is driving the plot forward and the one making the compositionally-spare photographs. In the end, if you buy this book for your library, don't just give it an idle flip of the plates and put it on the shelf for reference (although it will perform quite nicely in this mode as well). It merits a deep and thoughtful reading (yes, reading), and if you invest the time in this multi-layered, overlapped, not-yet-finished story, you'll emerge with a surprisingly rich and personal view of one of contemporary photography's most influential new leaders. 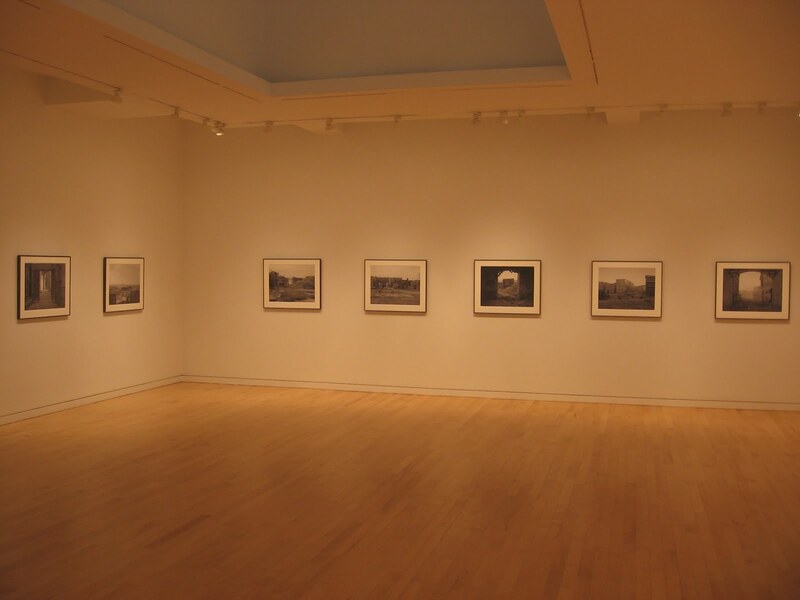 Collector’s POV: Alec Soth is represented by Gagosian Gallery in New York (here) and Weinstein Gallery in Minneapolis (here). 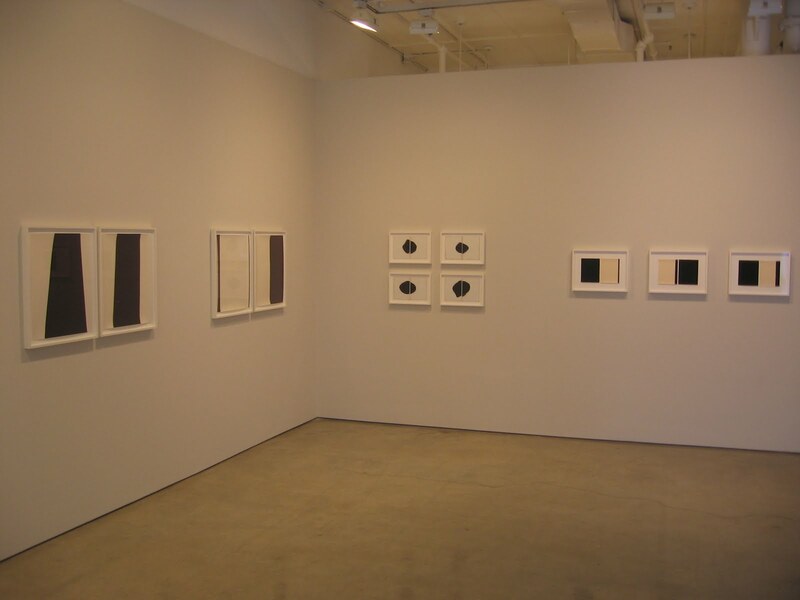 Soth's work has begun to appear in the secondary markets more consistently in recent years (a handful of lots each year), with prices ranging from roughly $4000 to $22000. Comments/Context: Elaborate, cinematic staging has been the hallmark of Gregory Crewdson's photography for more than a decade. In recent years, his sets have become increasingly extravagant, with massive crews of professionals on hand to create his dramatic (and often surreal) film-still scenes of suburban life. I have often wondered where the logical limit to these overblown constructions would lie - what is your next step when your last image took an army of people weeks to put together? Crewdson's newest work seems to begin again from the rubble of his previous ideas, as if his entire artistic enterprise finally collapsed under its own ponderous weight and Crewdson was left looking for a new path forward. 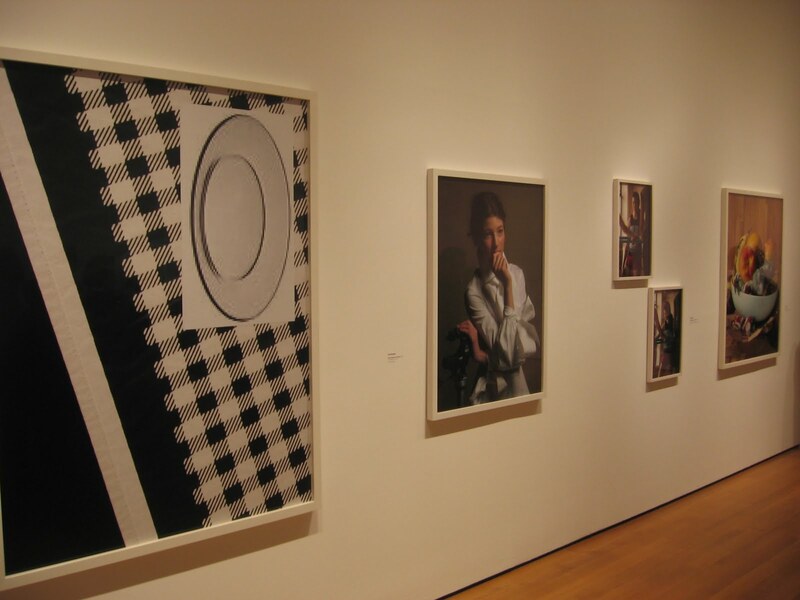 It has all the trappings of a mid-life crisis, including big frame-breaking changes: he's gone back to black and white, traveled to Europe, embraced digital, slimmed down his retinue, and returned to a closer connection with photographic truth. 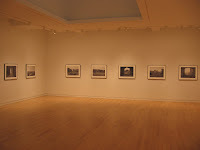 The result is a set of quiet, elegant images that are rooted in the traditions of the medium, but continue to explore some of the artist's interests in the nature of visual fiction. All of the pictures in this show were taken in the abandoned back lots of the famous Cinecittà studios in Rome, where streets filled with old stage sets rot and fade into obscurity. Stylistically, apart from a little bit of dramatic mist and some soft lighting (dawn and dusk), the images seem almost classically documentary. The architecture of the dilapidated stage sets is rendered in a array of crisp, controlled greys, empty and understated rather than operatic. His subjects are the layers of film-making fakery, gone to seed: scaffolding holding up paper thin facades, weeds pushing through molded cobblestones, muddy puddles dotting behind-the-scenes dirt paths, faux colonnades falling down. Stairs lead to nowhere, a broken boat lies in the middle of an intersection, sky pokes through splintered walls and a shattered plaster urn lies in pieces on the ground. In nearly every image, Crewdson captures the contrast of the frontal stage and the background machinations, both sides now coming apart, the illusion uncovered. Several pictures add an additional element of formal compositional framing, using an arch, alleyway, or door as a portal through which to view the truth of the deserted ruins. What I found most striking about these pictures was their overwhelming sense of silence. 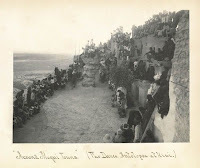 There are no actors, artfully posed in some enigmatic narrative; the stage sets themselves are the actors, and the movie was finished a very long time ago. At first glance, the images can seem a bit underwhelming (especially from afar given their middle tonality), but after further looking, they slowly reveal a more complex mixing of the ideas of reality and artifice. For me, this new work seems most like a bridge for Crewdson: leaving behind most of what came before and taking along a thin thread of connection to explore further going forward. 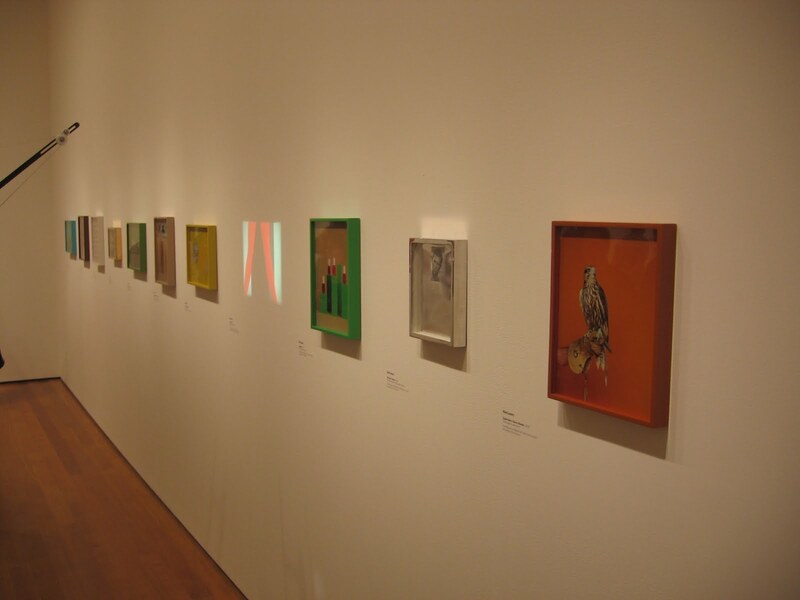 Collector's POV: The works in this show are priced at $30000 each. Crewdson's prints are regularly available in the secondary markets (both in the photography and contemporary art auctions), with prices ranging from roughly $4000 to nearly $100000. 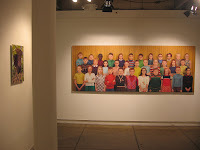 Comments/Context: In Ruud van Empel's newest works, the Dutch photographer has moved away from the lush leafiness of his previous jungle settings and has opted for the buttoned-up formality of the traditional class portrait, with rows of school children in their picture day best outfits, standing on risers against a yellow curtain. Squint your eyes to blur the details and his ten foot wide panoramas look like any school picture taken in the past 50 years. But when your eyes come back into focus, it becomes clear that van Empel's children are unlike any you have seen before. Using Photoshop to composite together hundreds of images, he has created a signature style that has become the hallmark of his work: glossy perfected children with big eyes, staring out from the plane of the picture with an almost surreal oddness - what seems at first glance to be idealized comes out more than a bit unsettling. 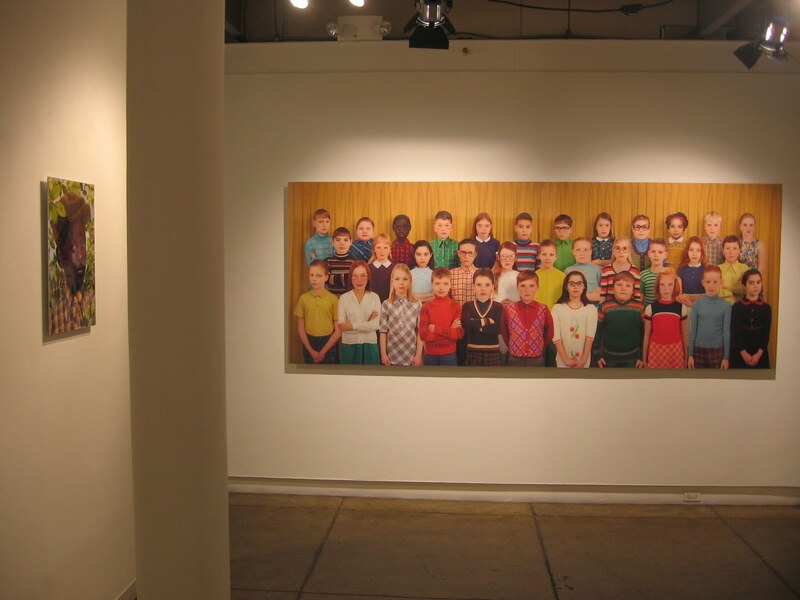 In past works, he has highlighted a single child, or perhaps a pair of kids, sometimes in matching fancy dresses or sport coats, sometimes with bare skin. These new works amplify and expand his cast of characters, allowing him to play with clothing, hairstyles, and facial features to create a kaleidoscope of different personalities. On one wall, all of the school children are black; on the other, it's a predominantly white class with a lone black student. Subtleties of culture come out in bow ties and sweater vests, braids and barrettes, Peter Pan collars, striped turtlenecks, and bold, candy colored patterns, a range of faces lit by sparkly eyes and hiding underneath big glasses. In his prior work, van Empel used the natural environment of lily pads and flowers to create a kind of protected paradise for his subjects; in these works, he pushes on this concept of childhood innocence, but from a less fanciful and whimsical perspective; the formality of school creates boundaries and limits. The flatness of the compositions and the "optimized" children still make for an unnerving scene, but the entire effect seems better balanced with reality, closer to real life to make his tweaks and constructions all the more resonant. 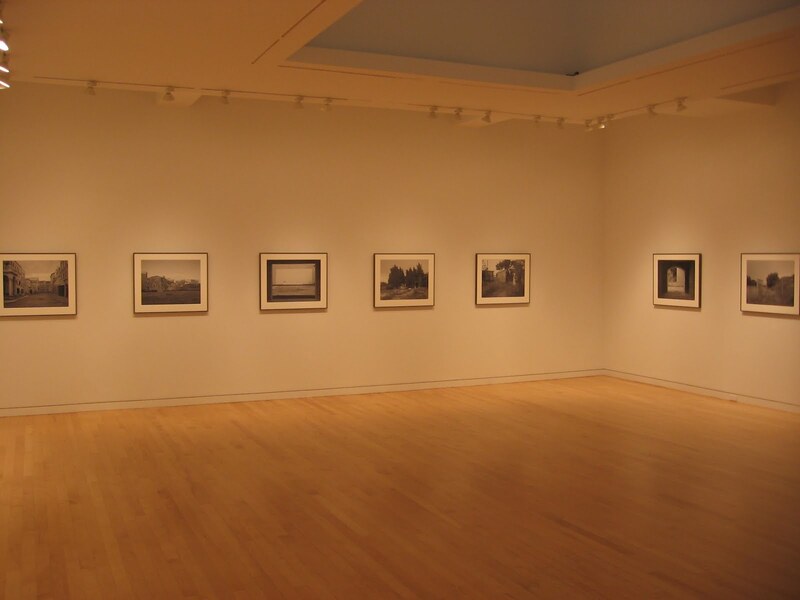 This show only contains a couple of works and its location in the galleries in the back tests the viewer's willingness to wander through another larger show to find the pictures. That said, I was intrigued to see how van Empel is evolving his style and finding new ways to situate his instantly recognizable characters. 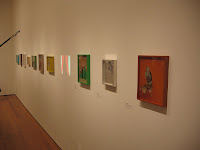 Collector's POV: The works in this small show are priced as follows. 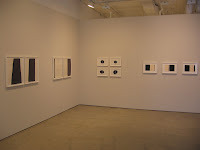 The two large images are priced between $59000 and $69000, depending on the location in the edition; the two small images are priced between $12000 and $14000, again in a rising edition. Van Empel's work has recently become more consistently available in the secondary markets, with a handful of lots coming up for sale in any given year. Prices have been steadily rising, from roughly $15000 to up over six figures, with a sweet spot in the low 30s. 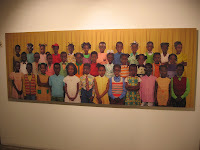 Van Empel is also represented by Flatland Gallery in Utrecht (here). 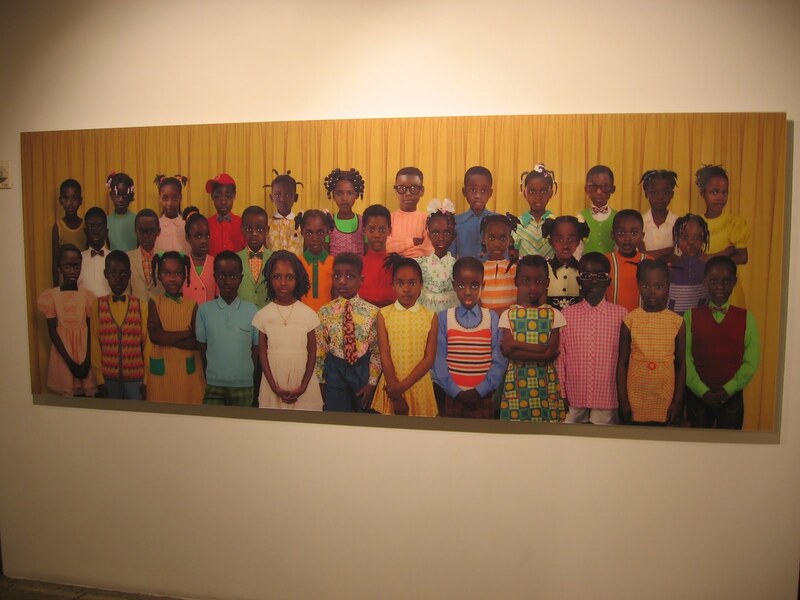 As an aside, I think it would be fascinating to hang one of these van Empel school portraits together with one of Tomoko Sawada's class pictures (all of herself) to see the contrasts/commonalities in style and message. Swann's Fall season various owner sale takes place tomorrow, with a broad selection of photographs on offer and a few photobooks mixed in for good measure. There are few real standouts in this auction, but plenty of lower end vintage work and later prints to sift through. Overall, there are 363 lots available, with a total High estimate of $2037750. The complete lot by lot catalog can be found here. The 3D version is located here. Comments/Context: When you first walk into Alison Rossiter's new show, you might be forgiven for thinking she is a painter, channeling Morris Louis and Barnett Newman using an inky black monochrome palette. Get up close to the works however and you will see they are not actually paintings but photographs, her high contrast abstract forms made by depositing chemical developers (pouring, dipping, etc.) over decades-old expired photographic papers. In an age when digital technology is forcing many traditional photographic paper makers out of business, her process-centric, darkroom-based works are a conscious look to the past. Her works bring together the physical craftsmanship of the hand made, with the elements of chance introduced by the decaying papers. Blobs of developer pool and puddle in their own ways, and some of the papers have become tinted a light almond, adding softness to the otherwise hard-edged geometric compositions. 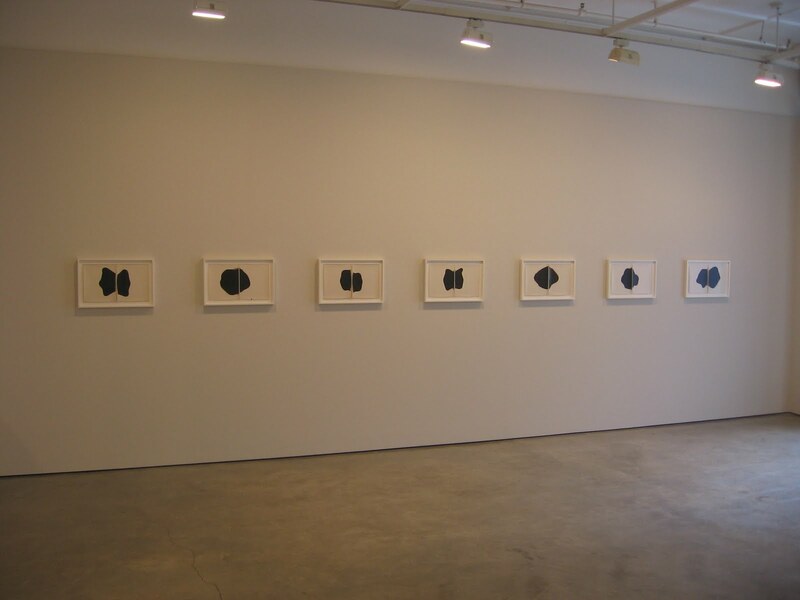 Rossiter's abstractions alternate between crisp, angular forms of dark and light, and amorphous organic lumps that resemble Rorschach inkblots. When I first walked into the gallery, I was most drawn to the bold sharpness of the cool squares and lines; they seemed altogether familiar. 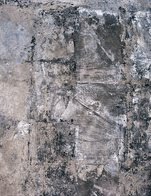 But after a few moments, I started to think that these works covered ground that had already been well farmed by any number of painters from the last 50 years, and I became more interested in the bulging and shifting black amoebas. These images seem to better combine the unanticipated and accidental with the conceptual construct of mining the unexpected treasures of the old papers. I like the fact that they are more unplanned and indefinite. I think the underlying question raised by these works is whether an exciting new visual vocabulary can be developed (no pun intended) using these kinds of processes. "Painting" with chemicals and allowing for chance reactions aren't enough; the results need to take us places we haven't been before. I think the best of the works here have started to go somewhere original, and I will be interested to watch as Rossiter continues to push the edges of photographic abstraction even further. 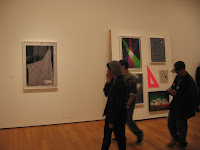 Collector's POV: The prices for the works in this show are as follows. The 12x10 single images are $2350 each. The larger 24x20 diptychs are $4950, while the smaller 9x7 diptychs are either $3350 or $3400. The 12x10 diptychs are $3900 each. Rossiter's work has not yet reached the secondary markets in any meaningful way, so gallery retail is likely the only option for interested collectors at this point. 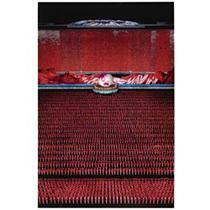 I first saw Rossiter's work at Stephen Bulger's booth at AIPAD; he also represents the artist (here).